It may seem strange to review a game from 13 years ago, but just because it isn’t the latest and greatest doesn’t mean you should ignore an old game. These underrated gems still offer unique gameplay, and System Shock 2 shaped FPSs and RPGs for years to come. Level Design: I’ve played a number of sci-fi shooters before, but none with such a clearly laid out ship design. Instead of being shepherded down a single path, each deck is arranged functionally, with many different paths and countless nooks and crannies. This is one thing I love about game engines from this period, big open spaces with admittedly less detail but greater scope and less load screens. Authenticity of experience is more important than intricate detail in my view. And the environment changes around you, it really is a living ship (at least in one sense of the word). There’s a nice nod to the first game in the last level which shows the love the game designers had for this material. 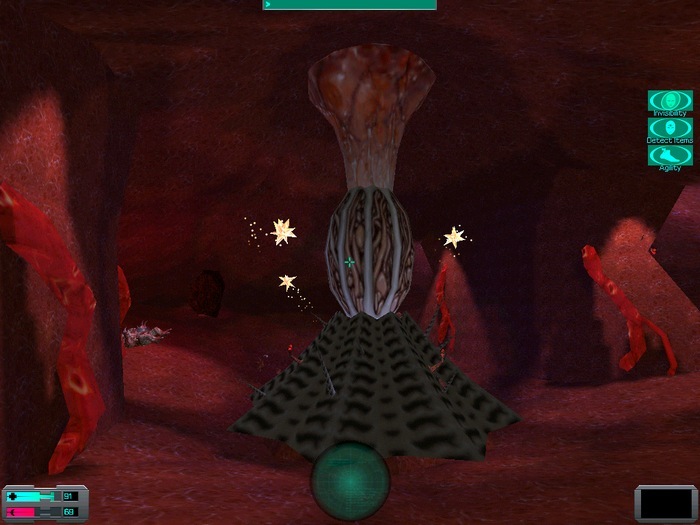 Enemies: There’s a nice mix of biological and technological opponents as well as things in between. The game has been criticized for the hokeyness of some enemies, including psi-monkeys and cyborg ninjas, but I don’t think this takes away from gameplay. Rather I think it adds a little humor to what is otherwise a serious story. Difficulty rises nicely with ability, but even grunts are not routine (those monkeys can be hard to hit)! Story: This is by far one if the most unique features of the game. Rather than telling the story in cutscenes, bits and pieces are revealed through log entries, commuications with unseen helpers, scripted events and ghostly encounters. The logs especially add to the feeling of a living ship, portraying more than a dozen perspectives on the grizzly events. The story itself is pretty straightforward, a ship is in deep space when they are hailed by a nearby planet. Those that land bring back a hostile alien lifeform which infects the crew, turning some into zombie hybrids and others into far worse. But something else came onboard, a hostile AI with delusions of Godhood. She created the aliens and she wants you to destroy her rebellious children. 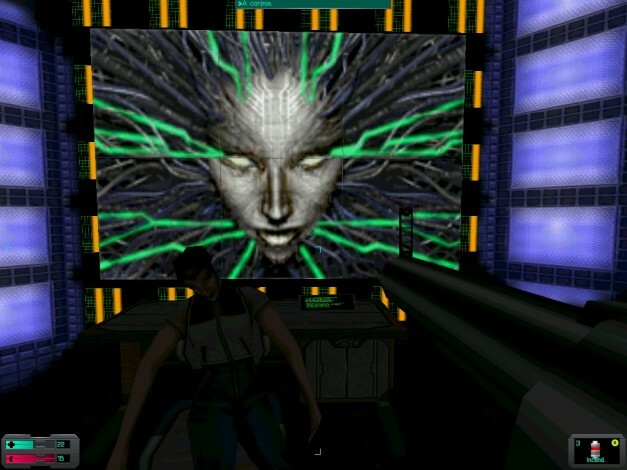 SHODAN: Easily one of the best villains of all time, with a creepy distorted voice, and no desire to hide her disgust for a worthless bag of meat such as you. And yet she needs you, at least for now. Her reveal in the middle of the game is a great twist and makes you see the game you’ve been playing in a whole new light. She’s not just evil, but lacks moral constraints of any kind, and has a great and terrible vision for humanity. Content: Shock is gory at times but not to the degree of one of its contemporaries, Half Life. It’s more scary than gross, but the second to last level is disturbing, you enter “the belly of the beast” literally. Fortunately this section is short, though I wish they had called doors something besides sphincters. RPG:A good blend of skills and weapons. It emphascizes hackers and psi-ops but that’s better than plain soldiers anyway. Weapons degrade when used but I think maintenance is a better skill to emphasize than repair. Psi abilities are the most stable and have more ammo. You can change your strategy without restarting the game, which is more flexible than the upgrades in Deus Ex. Overall a game you should definitely get your hands on, even at closer to a premium price. If you do get a copy you can use my guide to getting it up and running and enhanced. This is one I’ll probably be replaying in the near future (okay already am).